Back cover blurb: She stole her husband. Now she wants to take her life. After the horrors of the past, Louisa Williams is desperate to make a clean start. Her husband Sam is dead. Her children, too, are gone, victims of the car accident in which he died. Sam said that she would never get away from him. That he would hound her to death if she tried to leave. Louisa never thought that he would want to harm their children though. But then she never thought that he would betray her with a woman like Sophie. And now Sophie is determined to take all that Louisa has left. She wants to destroy her reputation and to take what she thinks is owed her - the life she would have had if Sam had lived. Her husband's lover wants to take her life. The only question is will Louisa let her? Her Husband's Lover is the novel I've been waiting for since The Long Fall. I hadn't realised how much I had missed the intricate weaving of Julia's plots until I picked this up. Louisa Williams is struggling to come to terms with the loss of her husband and two children in a car accident. She cannot face the harsh reality that she was losing Sam anyway to his pregnant girlfriend Sophie. Louisa is a woman who is used to succeeding, so to be recuperating in a clinic is her worst nightmare. At least until the court hearing into the circumstances surrounding the horrific accident. Former model and drug addict, Sophie, despises Louisa. She blames her for Sam's death and wants to see her suffer for taking away the man she loved. Determined to bring Louisa down, she will stop at nothing to get what she wants. Told from both of their perspectives; Louisa and Sophie are both ridiculously unreliable, and in turn you will despise and sympathise with both of them. 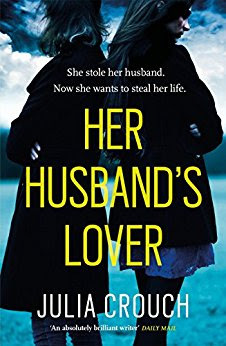 Her Husband's Lover is such a clever novel that leads you down one path, before turning you around, blindfolding you and whacking you over the head so that you think, don't be ridiculous, that did not just happen.. But trust me - it did. Her Husband's Lover is available now via Amazon online and all good book shops.